One of the most requested by homeowners, wood fences offer security and beauty in a wide range of types to compliment any home. 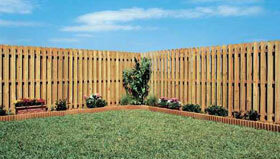 Our wood fences come in a variety of styles, including full privacy, semi-private, picket, split rail, and post& rail. 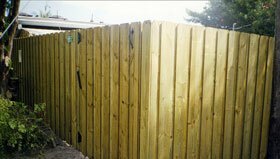 We offer wooden fences in 4’, 5’, 6’, and 8’ heights made from a variety of different woods. 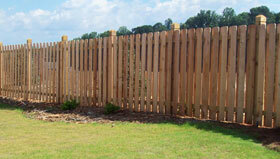 We can also custom cut and install wooden fence types that need to meet designs specs. and codes for any community. Many clients want wood fence contractors in South Florida to custom design a fence, for their particular home and landscaping and Gold Coast is happy to sit down with the customer, to fully discuss this option. Wood fencing lends itself to a variety of options, including a lattice top or you may choose to have your boards round-cut or in a “dog eared” fashion for a more stylish finish. We pride ourselves on showing and maintaining large inventories, and selections for the convenience of our customers. Looking for just the right wood fences to showcase your home? 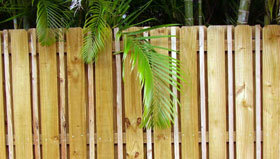 Gold Coast Shutters and Fence, wood fence contractors in South Florida is the company for you. 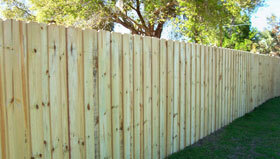 With our extensive fencing background, we can help you design one-of-a-kind wood fences for your yard. Just tell us your unique ideas and special needs and our expert staff will create a fence to solve your problem and complement your home and landscaping. If you are looking for something really special or a particular color or species of wood call Gold Coast Shutter and Fence, one of the number one wood fence contractors in South Florida. Call for a FREE ESTIMATE. In Broward County call: 954-472-7766. In Palm Beach County call: 561-395-5530 and in Miami/Dade County call: 305-480-5885. Call Gold Coast Shutters and Fence today and save thousands. 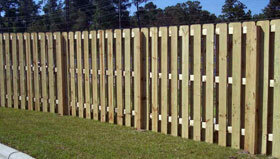 We are your one stop shop for all of your wood fence needs.